There are no universally accepted Buddhist wedding traditions, the ways a particular couple express their Buddhist values depend on cultural influences. Buddhists value the qualities of love, wisdom and respect and follow a standard of ethics found in most religions. A Buddhist marriage ceremony often provides space for the newly-weds to meditate on transferring their Buddhist principles into their marriage. Buddhist values are shown through symbolic elements in Thai marriage ceremonies. Meaningful symbols and photographs of loved ones or ancestors on an altar show the importance the couple put on love, respect and honor. Meditation, victory banners and a tea ceremony represent those same values. Incense and prayer flags represent positive space and blessing. A vegetarian meal is served to acknowledge no harm of life, though Buddha ate whatever was offered, demonstrating the value of gratitude. Transformation and wisdom are symbolised with lotus flowers, candles, prayer, meditation, bells or gong. Golden fish represent joy and happiness. A Buddha statue and parasols denote protection and the use of string represents connectedness. Water and a white ceremonial scarf stand for purity. Thailand weddings have two parts. The Buddhist component includes the recitation of prayers and the offering of food and other gifts to monks and images of the Buddha. The non-Buddhist component is rooted in cultural traditions. Historically, Buddhist monks were never present at any stage of the actual marriage ceremony. Before marriage, a couple might consult a monk to choose their wedding date and would seek a blessing from their local temple before or after being married. 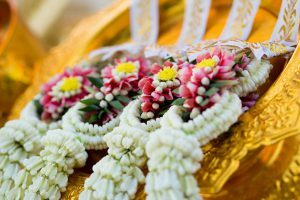 Traditional Thai marriages take place in the morning. The couple first bow before an image of Buddha and recite certain Buddhist prayers, usually the Three Refuges and the Five Precepts. Candles and incense are lit and the parents of the couple are called upon to “connect” them together, by placing twin loops of string or thread on the heads of the bride and groom that link the couple together. Then the monks unwind a thread they are all holding and bless the new couple. The lead monk puts the end of the thread in water to make it blessed. The blessed water is mixed with wax drippings from a candle lit before the Buddha image and other unguents and herbs to create a paste that is then applied to the foreheads of the bride and groom to create a small dot. The highest-ranking monk present may give some words of advice or encouragement to the couple, the couple then make offerings of food to the monks and cash gifts to the temple, at which point the Buddhist portion of the ceremony is concluded. After the marriage ceremonies, a feast is prepared for guests. An abundance of food shows the Buddhist principle of generosity as the couple will not know the number of guests attending. Excess food is given to family members or donated to charity. The newly weds welcome each guest and thank them for attending. The guest gives an envelope containing money to the couple and in return the couple present a small gift to the guests as a reminder of their wedding day. A close friend invites the newly weds to say a few words to the guests and an elder, perhaps the groom’s boss or the village mayor, is also invited to say a few words about the couple. Then there is music and dancing for the rest of the night. Buddhist ceremonies can be created anywhere in the world. 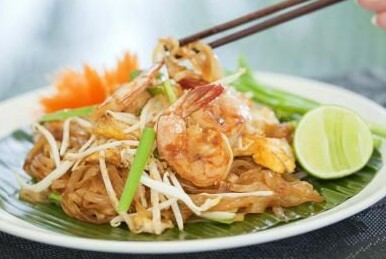 Many companies exist to help you plan your own traditional Thai marriage, if you do not want to plan this yourself. Create a shrine, complete with a Buddha image on a table, candles and flowers. The wedding party can recite the Vandana, Tisarana and Pancasila and the couple can then light the candles and incense sticks and place flowers on and around the Buddha. The couple can then exchange traditional vows found in the Sigilovdda Sutta and together the wedding party recite the Mangala Sutta and Jayamangala Gatha as a blessing to end the ceremony.